This is a really fun trail and a good overnight trip, but don't expect to just show up and hike. Access to the 4x4 access road through private ranchlands is made through The State of Hawaii- Department of Land and Natural Resources which manages the cabin and permit reservations. 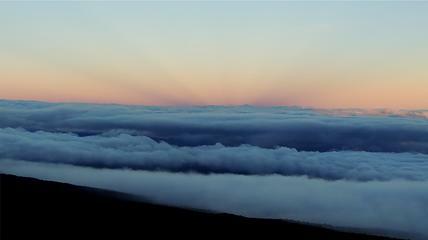 I have stayed at the Ainapo Cabin up the Ainapo Trail to Mauna Loa Summit a couple times. 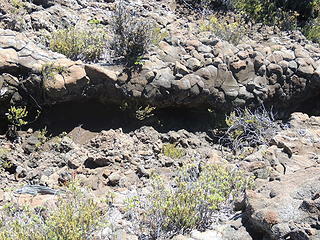 This is an ancient trail used by Hawaiians long before white men arrived. 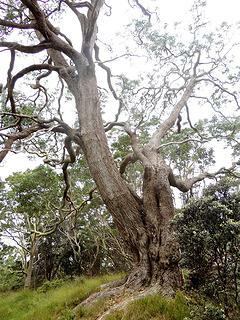 It is steep and rugged and the scenery all along the trail changes as you progress from beautiful Koa forests with huge trees some bent over touching the ground due to their own weight to the sturdy and tenacious Ohia with their bright red multi-stamen flowers. 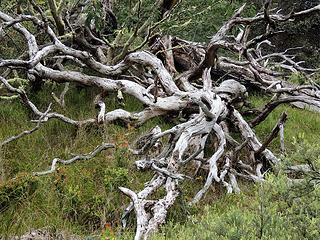 As you move higher up the trail, the trees become more sparse with many of them seeming more like shrubs than trees. 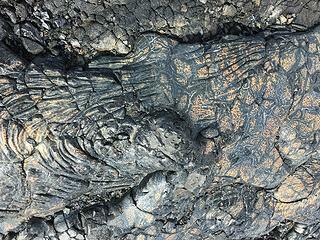 Traveling over varied types of lava is tiring and you need sturdy boots to provide some ankle support. I love all the different types of lava from smooth to rolled like wire rope to jumbled fist sized balls. Each provide their own beauty and challenge. Once you finally reach the cabin, sit, relax and enjoy the expansive views below. You have reached about 7,500' elevation. The air is thinner and sitting with views all the way down to the ocean below are calming. The cabin itself is quite nice with bunk beds for about 6, a table to eat at, a composting toilet outside and nice sleeping pads on the beds. Bring your own lights. Outside, if you are lucky and the sky is clear, you can watch for shooting stars, look for constellations and planets. It is peaceful and quiet here so your soul can refresh itself. 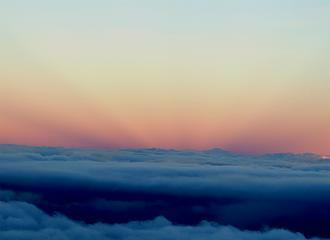 Plan to rise early for the spectacular sunrise to the East. Those of us from the west coat see sunsets. From here you get to see the sun emerge from the ocean. It is an event to see. I never went up the Ainapo trail because it used to be hassle to get permission from the ranch owners. (15 years ago, anyway). I think you had to make an appoint to pick up the gate keys and bunch of other stuff. It really isn't hard to get permission now since it is handled by the state. You can do it online and get a gate code the night before you go in. Lovely! I scouted the lower part of the Ainapo trail in 1978 when there was hardly a route to be found. I enjoyed the courtesy of the folks at Kapapala ranch and the wonderful forest above. You sure are getting to some great places. When are you going to try Waimanu Valley? I actually did Waimanu Valley twice already. I will do a TR on it if you like. It is really a beautiful place...if it isn't a downpour as it was my first trip there. I love all the different types of lava from smooth to rolled like wire rope to jumbled fist sized balls. Each provide their own beauty and challenge.
" Jumbled fist-sized balls" is 'aa', a word that spellcheck invariably corrects to 'as' or 'at' until you teach it that aa is actually a word.The old joke is that aa is what a bare-footed Hawaiian would have said when walking on the very sharp blocks: " Ahh AHH!" I tried it once...very painful thing to do! 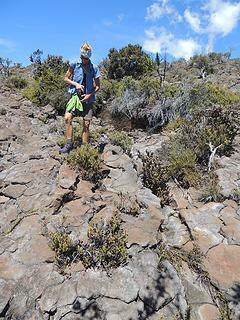 Some ancient Hawaiian trails would be rerouted to avoid a new aa flow. The basic difference is due to viscosity, which in the case of basalt is due to temperature, not composition or fluid content. 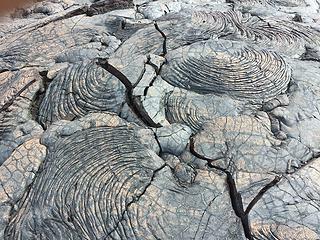 Lava upon effusion is hotter and less viscous, generally resulting in pahoehoe, which often transforms to aa as it flows and cools. 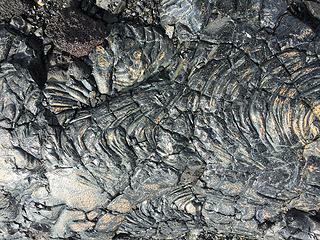 There are no known examples of aa transforming into pahoehoe. Thanks for the information. Are you a geologist or spent some time here? I have tried to remember some of the lava names, but am having trouble making them stick. Do you know what the pic below is called and what causes the bronze coloring? Are you a geologist or spent some time here? Both....geology professor ( emeritus) who loves the Big Island volcanology. I have been fortunate enough to have had extended stays in Hawaii a number of times, including living in Waikiki for two years before Hawaii was a state (when it was very laid back), and the time I led a field trip to the active volcanoes for one of my Volcanoes classes. 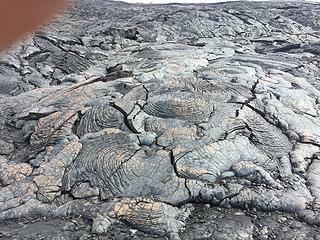 Each of your four pictures shows the relatively smooth surface of pahoehoe, and the second one shows a reasonable example of ropy lava.....the wrinkles being as if a large diameter rope had been laid back and forth and closely spaced on a deck. 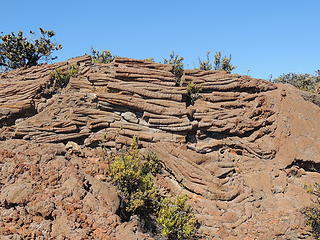 Ropy lava usually forms when there is a difference in rate of movement of a slowly moving pahoehoe flow, such that the smooth surface wrinkles, similar to pushing a throw rug up against a wall. The bronze surface is due to oxidation of the iron in the basalt, almost like a freshly- cut pear or apple turns brown due to oxidation ( I don't think due to iron in the fruit, but I'm no biochemist ). That is awesome. It is really nice that you are willing to share your expertise. Also can you explain Choss? I know there is a lot of it out near Mt. Deception and that area. How does it get formed? 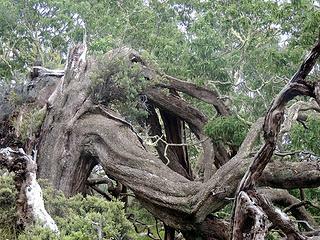 Could you suggest any places here on the Big Island to see unusual formations? Hey Lookout Bob, did you see my TR on Waipio to Waimanu? This is a lava blister, formed by a gas bubble (mostly water vapor) when the lava was still molten. Using grass for scale, this is is a moderate sized one. It can be a hazard to one's flesh if you break through a thin crust into a blister when walking around on a cooled flow. 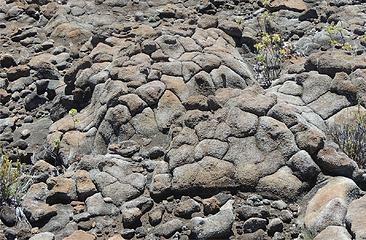 By the way, that picture shows a great example of ropy lava. It really does resemble wire rope, as you observed in your original post. You wrote:"That is awesome. It is really nice that you are willing to share your expertise." Reply: You may be interested in this thread: " What's this rock? What's that landform?" "I love backpacking and seeing all sorts of geologic formations both here and in Washington. Just wondering if you have ever hiked out in the Bailey Range of the Olympics?" No, I haven't been to the Bailey Range. However, better yet is an excellent resource on geology of the Olympics is Geology of Olympic National Park by Rowland Tabor. "Also can you explain Choss? I know there is a lot of it out near Mt. Deception and that area. How does it get formed?" Choss, also called scree, is simply an accumulation of loose rock fragments due to mechanical (physical) weathering. Choss or choosy also is used by climbers to refer to any very loose fragments rock...not the most secure and enjoyable to be on! A common sequence is that once a piece breaks off its bedrock source, often due to frost wedging, gravity moves it downhill. An accumulation of scree is called talus. Talus slope are very common below cliffy areas of any rock type and for foot travel can range from very fun (' scree skiing') to abominable (as on Mt. Custer , aka 'Mt. Cusser'). [ On January 8 this year a friend, Steph Abegg, and I gave a public talk called "Splitters and "Choss Piles: Rocks We Climb On in Washington". I can give the illustrated one-hour presentation again to any group upon request]. Talus slopes almost always range in angle of repose from between 34 and 37°, even though they invariably look steeper when viewed head-on. 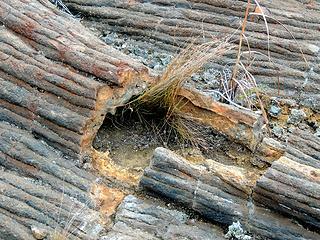 The largest rock fragments tend to fall to near the base of the talus slope due to their greater mass. "Could you suggest any places here on the Big Island to see unusual formations?" Excelllent question! There are several worthwhile books on Hawaiian geology for the layperson that give specific locations for interesting features. 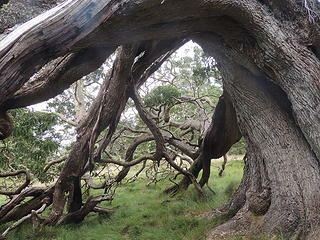 Check a bookstore or a gift shop in the national park.